When staff members of the Idaho Transportation Department applied to receive $90.2 million dollars from the Infrastructure For Rebuilding America program to expand a 2.8-mile section of the I-84 corridor just west of Boise, Idaho, they never expected the U.S. Department of Transportation to approve the entire amount. In September, the Federal Department of Transportation commemorated the monumental grant with a celebration and a giant white check with the amount of $90,240,000 written on it. Those in attendance included FHWA Deputy Administrator Brandye Hendrickson, Idaho Gov. C.L. “Butch” Otter, Idaho Transportation Director Brian Ness and several local government officials. 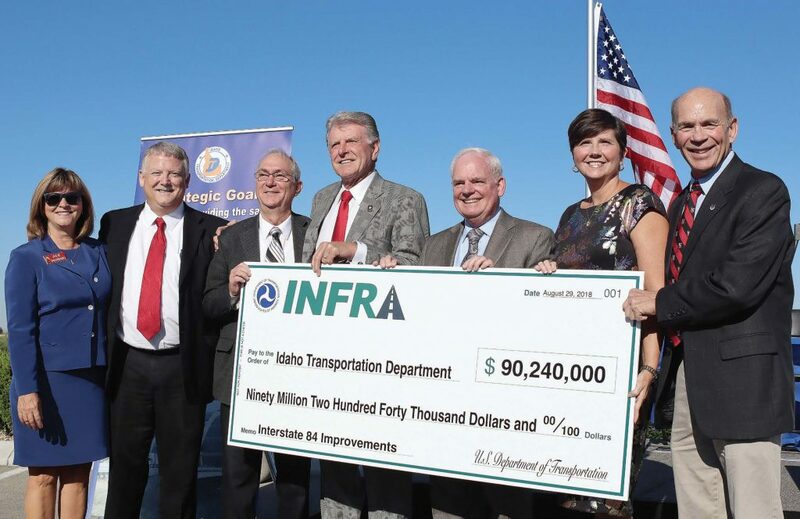 It is the largest competitive grant the Idaho Transportation Department has ever received and one of the most robust in the country. As transportation to and from major Northwestern cities has increased, Idaho has grown, especially near the Boise area. Per percentage of growth, a January 2018 article in USA Today listed the Gem State as the third fastest growing state in the U.S. In 2010 Idaho’s population was 1,567,582, according to census data, and by 2026, the Idaho Department of Labor projects that number to reach roughly 1.9 million. I-84 connects Portland, Ore.; Boise; and Salt Lake City, Utah. Additionally, via a connection to I-82, the highway also indirectly serves Seattle, Wash. In total, it’s estimated that this portion of the I-84 corridor project will impact a traffic count between 95,000 and 100,000 vehicles per day. 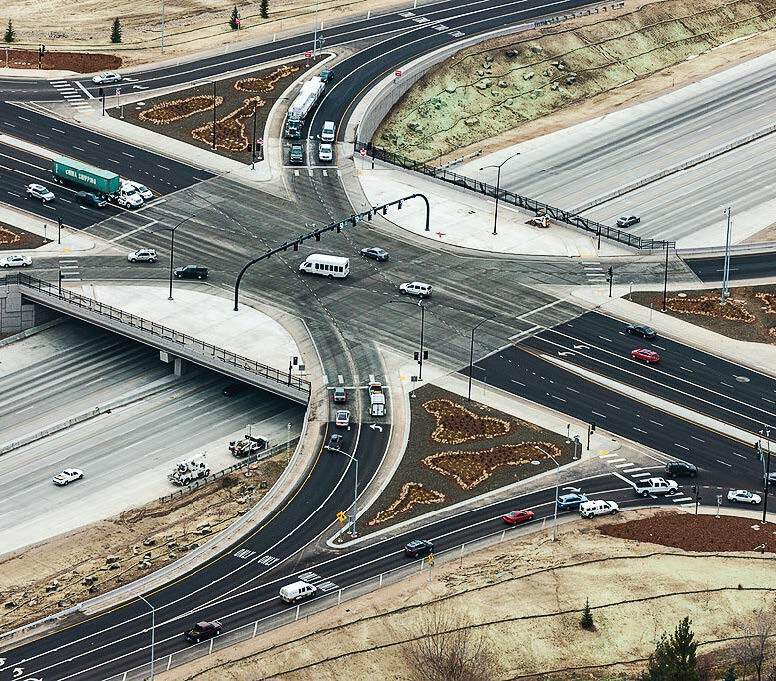 The construction on the I-84 corridor will widen four lanes of traffic to eight to prevent the highway bottlenecking that takes place as vehicles enter and leave the greater Boise area. The additional lanes and new concrete shoulder also address safety concerns. According to Stoll, roughly five injury or fatal accidents occur on this stretch of I-84 every month, with 210 transpiring from 2011 through 2016. The INFRA Grant — previously known as a TIGER Discretionary Grant — application process was completed through a joint effort between the Idaho Transportation Department and the Community Planning Association of Southwest Idaho. A major reason why the state received such a large grant is because of how detailed the application was and how much support was demonstrated at local and state levels. Support for the project was represented by the diverse use of local and state matching funds, which included the city of Caldwell and Canyon County chipping in $125,000 each. This may be a small piece of the estimated $150 million project, but it shows a high level of dedication when small municipalities contribute a major portion of their budget. Initial construction began in the fall, with temporary lanes getting paved on the existing highway shoulder. At the time of press, construction on an overpass at the west end of the project was expected to begin in February and take roughly 10 months to complete. Construction bids should take place in the spring for the rest of the I-84 corridor project, with work beginning in the summer and running through 2020. In order to widen the 2.8-mile section, several bridges and overpasses will need to be replaced. Ramps will also be improved. While this specific project will address an important section of the I-84 corridor, Idaho has been putting money into the interstate for years, impacting the region economically through commerce, job creation and more. According to Ness, the plan is to continue developing transportation in Idaho to keep up with its growth and help attract commercial and industrial businesses.